Preface (N.C. Flemming). EuroGOOS Conference (S. Vallerga). Introductions. The Second EuroGOOS Conference; Introduction (D. Tromp). The EuroGOOS forward look (J.D. Woods). EUROMAR - A new era (P. Ehlers). Evaluation of Operational Oceanographic Services. Valuing marine activities in Europe: provisional estimates, concepts and data sources (M. Brown). The EuroGOOS data requirements survey (J. Fischer, N.C. Flemming). Economic assessments of the value of marine industries and services and user requirements (L. Castellucci). The Global Ocean Observing System (GOOS) in 1998 (C. Summerhayes). Operational Oceanography for Sustainable Coastal and Regional Development. Real-time forecast modelling for the NW European Shelf Seas (M.W. Holt). Increasing resolution and forecast length with a parallel ocean model (T. Wilhelmsson et al.). Operational hydrodynamical model of the Danish waters. Danish National Program for Monitoring the Water Environment (H.R. Jensen et al.). Spanish Ocean Observation System. IEO core project: Studies on time series of oceanographic data (L. Valdés et al.). Long-term surface observations from ships of opportunity in Norwegian waters (T. Gytre et al.). CORIOLIS-Atlantic, an in situ network for operational oceanography (P. Marchand). Sea level measuring network in Finland (O. Korhonen). Ferry observations on temperature, salinity and currents in the Marsdiep tidal inlet between the North Sea and Wadden Sea (H. Ridderinkhof et al.). Operational forecasts during the construction of the Fixed Link across the Öresund (L. Funkquist). Storminess and environmentally sensitive Atlantic coastal areas of the European Union (I. Lozano). EUROGOOS Regional Seas Projects. Monitoring of the Arctic Ocean (O.M. Johannessen, S. Sandven). Forecasting the Baltic (E. Buch). Mediterranean ocean forecasting system: First phase of implementation (N. Pinardi et al.). Forecasting the Atlantic: Towards an Atlantic Pilot Experiment (C. Le Provost). Operational Ocean Forecasting for the Mediterranean Region. Operational forecasting in the Aegean Sea: The POSEIDON system (K. Nittis et al.). Remote sensing data for the Mediterranean Forecasting System Pilot Project (P.Y. Le Traon et al.). Operational system for marine prediction in the Mediterranean: Description and products (B. Telenta et al.). Diagnostic simulations of the seasonal circulation in the Sicily Channel (R. Sorgente, M. Zavatarelli). New Technology for Operational Oceanography and Technology Transfer. A newly designed deep sea YOYO-profiler for long term moored deployment (C. Waldmann et al.). Coastal environment of the Seine Bay area monitored by a new French system of automated measurement stations (P. Woerther). The potential of HF radar for coastal and shelf sea monitoring (L.R. Wyatt). Design and use of advanced technology devices for sea water monitoring (G. Zappalà et al.). The use of "CARAVELA 2000®" vehicles in operational oceanography (M. Alves et al.). A new concept for rapid assessment of oceanic environment (V. Mariette et al.). A bi-directional data link into the deep sea - The DOMEST project (G. Meinecke et al.). GEOSTAR - GEophysical and Oceanographic Station for Abyssal Research (L. Beranzoli et al.). Ferries in operational oceanography - The German Ferry Box project (P. Koske). Mobile lidar fluorosensor equipment for continuous seawaters monitoring and in situ photosynthetic measurements: The ENEA realisation (R. Barbini et al.). Experimentation of an innovative Lagrangian coastal drifter (A. Ribotti et al.). Global Monitoring and Modelling for Climate Change Prediction. Real-time ocean forecast modelling for the Global Ocean and the Atlantic (H. Cattle et al.). Meeting the Challenge: Real-time sea-state forecast modelling for the Atlantic at The Met Office (M.W. Holt). European co-ordination in meteorology (F. Gérard). Acoustic Monitoring of Ocean Climate in the Arctic (AMOC) (O.M. Johannessen et al.). Initial concepts for IAS-GOOS (C.N.K. Mooers et al.). Remote Sensing in Operational Oceanographic Systems. The DUACS project: towards operational use of altimeter data in coupled ocean-atmosphere models for climate studies and forecasts (P. Gaspar et al.). Absolute calibration of the EnviSat-1 radar altimeter - a new generation dual frequency altimeter (M. Roca, R. Francis). Multi-sensor satellite monitoring of ocean climate (T.H. Guymer et al.). Near real time processing and validation of T/P and ERS-2 altimeter data (DUACS project) (C. Boone et al.). Satellite data use in Finnish winter navigation (H. Gronvall, A. Seina). Complex ERS-2 SAR wave mode (S. Lehner et al.). SAR wind measurements during the FETCH experiment (J. Horstmann et al.). COASTWATCH: Integrating satellite SAR imagery in an operational system for monitoring coastal currents, wind, surfactants and oil spills (O.M. Johannessen et al.). Data Assimilation and Advanced Models, Global and Coastal. Assimilating satellite altimeter data in operational sea level and storm surge forecasting (M.E. Philippart, A. Gebraad). The use of SeaWiFS for operational monitoring of water quality in the North Sea (H.J. Hoogenboom et al.). Evolutionary computation for climate and ocean forecasting: "El Niño forecasting" (A. Álvarez et al.). Advanced Ecosystem and Water Quality Modelling. Simulating the spring phytoplankton bloom in the Humber Plume (UK) with a variable phytoplankton carbon: chlorophyll-a model (J.I. Allen). Satellite observation and model prediction of toxic algae bloom (D. Durand et al.). Microbial parameters for advanced ecosystem models (R. Zaccone et al.). New operative methods to study pelagic ecosystems (M. Marcelli et al.). Author-Index. List of participants. List of reviewers. The Global Ocean Observing System (GOOS) is an international programme for a permanent global framework of observations, modelling and analysis of ocean variables that are needed to support operational services around the world. 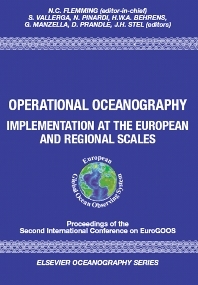 The EuroGOOS strategy has two streams: the first is to improve the quality of marine information in European home waters, and the second is to collaborate with similar organisations in other continents to create a new global ocean observing and modelling system that will provide the open ocean forecasts needed to achieve the best possible performance by local marine information services everywhere. EuroGOOS held its second international conference in The Hague in 1999. Here, the operational services already in place in the EuroGOOS regions were presented and evaluated. In addition, a "Forward Look" was presented, with targets for the next 5-10 years. The proceedings of the first EuroGOOS conference were published by Elsevier in the /locate/inca/600827EOS Series No. 62 Editors: Stel et al, ISBN 0-444-82892-3. For policy makers, politicians, scientists, the marine industry and oceanographers.